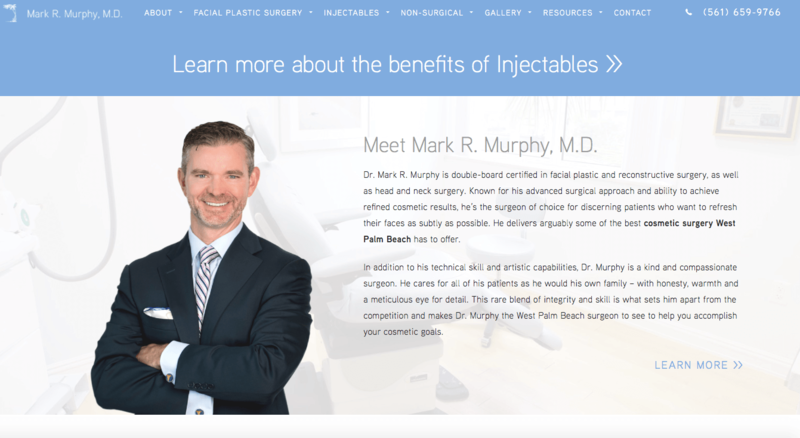 Dr. Mark Murphy - Facial Plastic Surgeon PalmBeachFacialPlastic.com SEOversite assisted Dr. Murphy in finding a new website design team who could also perform SEO, pay-per-click, and other online marketing. 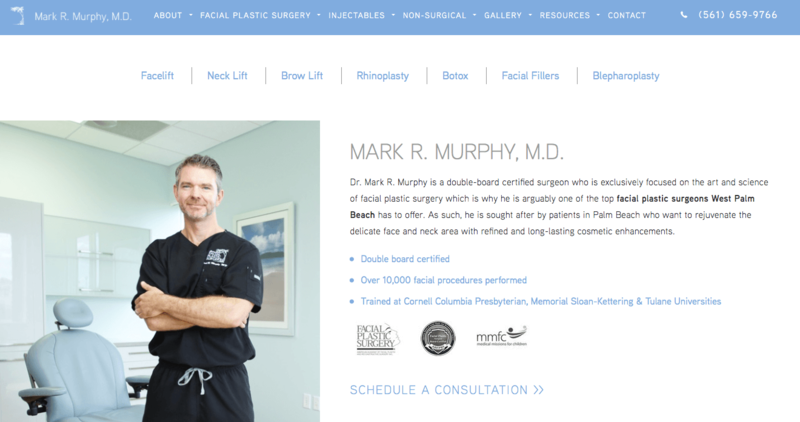 The prior Palm Beach Facial Plastic Surgery site worked well, but had become dated. Visitor and lead counts had plateaued and started to decrease. Over several months we helped design and consult on the build of a world-class website focused on attracting discerning clientele from Palm Beach County, Florida. In its first month live visitors increased by approximately 40% over the prior year and leads increased 43%. The entire cost of the site is covered with just 2 additional procedures created by the website's generated leads over a lifetime. The SEOversite team loves the bright color scheme, professional photography performed by the web team, use of real team members in treatment, ease of navigation, and showcasing of doctor accolades, leading to improved visitor to inquiry ratios onsite. 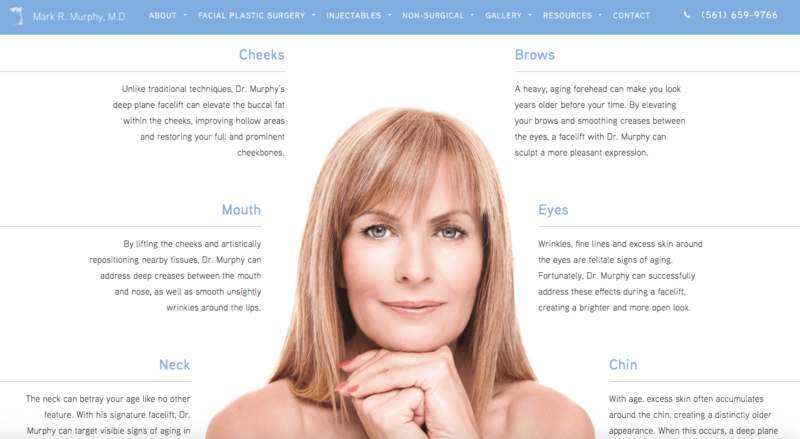 Here we have an overview for patients visiting the site to determine their facial rejuvenation needs. Importantly, each showcases Dr. Murphy's unique skill set in simple terms that any patient can quickly digest. The design is easy to read and draws attention in short 5-10 second spurts which is conducive to patient conversion. Many of our SEOversite Preferred Vendors can provide professional on-sight photo shoots which can best showcase the executive team of any business. In addition to superb high-definition photography, eloquent content creation to showcase the business owner, in this case a board certified surgeon, in the best light is paramount. A short overview page for easy consumption for the busy prospective buyer is showcased on the website. SEOversite has deep knowledge of the steps necessary to make website visitors contact your business. One key is to bullet point key accolades of the business's staff, products or services. Per usual, we see sleek, easy-to-navigate, modern design which appeals to most website visitors. SEOversite works with business to find opportunities to showcase real people (employees, clients, patients, and more) to lend the feeling of authenticity to your website design. Our SEOversite Preferred Vendors who design each website can often capture excellent, real-life examples. Here we see real patients being treated by the practitioners at Palm Beach Facial Plastic Surgery.